Mario has appeared in over 200 games; and 210 million units of the Mario games series have been sold since he first appeared in Donkey Kong in 1981. 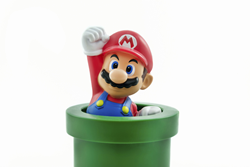 With the E3 Electronic Entertainment Expo (June 16-18) now revealing the latest video game launches in Los Angeles, Marketplace collectibles experts ParcelHero says video game collectors shouldn’t forget Mario, the world’s favourite Italian plumber and star of the best-selling video game franchise of all time. David continues: 'For anyone looking for fun collectables that are in demand, “Let’s a’ go!” Starting at the extreme end, some Super Nintendo Entertainment Systems (SNES) cartridge games have become almost legendary for their extreme rarity, and of course Mario appears in them all. Take the 1991 Nintendo Campus Challenge, produced especially for college gaming events. Mario appeared twice on this NES Cartridge in Mario 3 and Dr Mario. After appearing at college gaming events all copies were supposedly destroyed; but one at least is known to still exist and sold quite recently for $20,000. David says: ‘Of the more straightforward games, but still rare as Yoshi’s teeth, a sealed SNES PAL format copy of Super Mario World , in a vanishingly rare yellow box edition, with its Nintendo red strip and mint, sold for $13,000 in a major bidding war on eBay in 2012.